All plantings start at 8.00am. Please car-pool as much as possible. A TREAT barbecue will be provided after all the plantings. Bring a hat, sunscreen and water, plus gloves and a trowel if you have them. Check for likely changes due to weather conditions by ringing Angela McCaffrey on 4097 2426. TREAT and TKMG were successful in applying for funds from the State Government's 'Everyone's Environment Round 3' grants program. These funds will contribute to the TREAT plantings on the Freeman and Mather properties, and the Trust/TKMG plantings at Rock Road. The McCaffrey's planting has continuing funds from the Australian Government's 2011 Biodiversity Fund as part of the 'Clean Energy Future' grants program. All sites are continuations of previous plantings. The planting at Mather's is on Peterson Creek at the bridge on Peeramon Road, between previous plantings on de Tournouer's and Burchill's. The plantings on Freeman's are at the creek and along the NW boundary in preparation for a possum rope bridge across Lake Barrine Road. The Emms' planting is on their Cedarvale property, continuing with a corridor to link to their Barrine Park Nature Refuge. The McCaffrey's planting will strengthen their corridor. The plantings at Rock Road are widening the corridor there. At Massey Creek the planting will again be infilling the damaged 2012 planting, part of a corridor. Cutler Road is just past the Lake Eacham turnoff on Lake Barrine Road, from the Gillies Highway. Pressley Road is off the Gillies Highway near Lake Barrine. Kenny Road is off the Malanda - Millaa Millaa road, past Tarzali. Rock Road is at the junction of Kenny Road and McKell Road at Upper Barron. Massey Creek is on the Old Palmerston Highway towards Ravenshoe. Turn off the Kennedy Highway at the wind farm. Peeramon Road is off the Gillies Highway near Yungaburra. Look for the TREAT signs. Looking back at my previous predictions I see I missed out on the storms and I guess you did too. The forecasts for the wet season look a bit like this time last year: a slow start and lower than median rainfall but no threat of drought. In this period we should see Golden Pendas, Xanthostemon chrysanthus, flower with their beautiful golden blooms. On the ranges look out for the Golden Bouquet Tree, Deplanchea tetraphylla. This is also an effective street tree on the Esplanade in Cairns. Also flowering at this time of year are the two Lemon Aspens, Achronychia acidula and A. vestita. The latter is also known as Hairy Aspen and White Aspen. It can be differentiated by the hairy underside to the leaves where A. acidula is glabrous. Firewheel Trees, Stenocarpus sinuatus, are very late this year and will still be flowering when this goes to print. Native gingers of the genus Alpinia, flower in the wet. While Alpinia arctiflora has white flowers with a labellum to 4 cm and purple-grey fruit, the others have blue fruit and the small labellum is cream to pink. Alpinia hylandii can be seen flowering in the escarpment country around Kuranda and Boonjee on soils derived from metamorphic rocks. Many Sapindaceae fruit at this time of year. 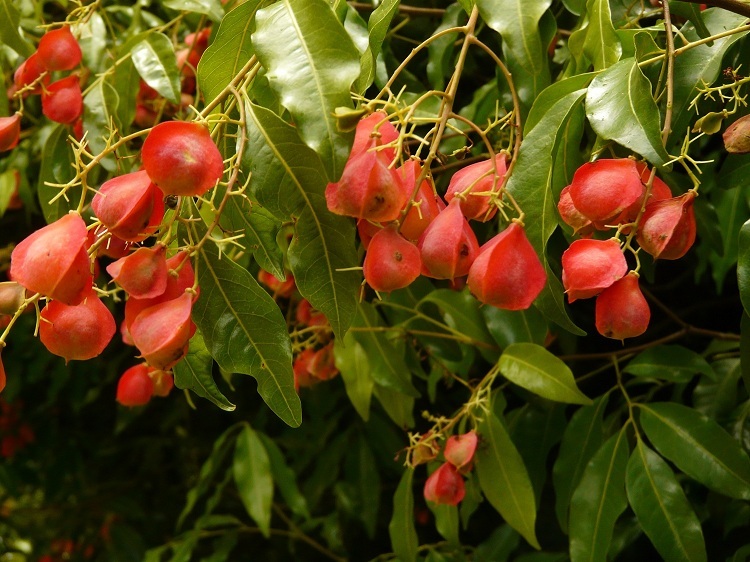 This is a widespread family with usually alternate compound leaves and including some well-known edible fruits such as lychee and longan but with many different fruiting structures. The plants usually contain saponins and in our Australian members of the family it is often in the fruit, so please no tasting! The most common fruit form is a three part capsule with black seeds and a coloured aril. Guioas will shed their seeds early in the wet but Harpullias will only be starting to do so at the end. Toechima pterocarpum, Orange Tamarind, makes a beautiful small garden tree with its dense foliage and its orange, pink or red fruit. The one illustrated grows opposite the Kookaburra Motel in Yungaburra in the garden of a TREAT stalwart. The genus name refers to the thick walled fruit cloaking the seeds and the specific epithet to the winged valves. Emmenosperma alphitonioides, Bonewood, is another one of my favourite garden or street trees and it can be seen in fruit near Malanda Falls. Fruit will finish ripening on the Flindersia species over this time. These are the 'maples, ashes and hickories' of the Wet Tropics rainforests. Their capsular fruit split into five valves or compartments where winged seeds are grouped either side of a woody divider. Gmelina fasciculiflora, White Beech, will drop its purple-blue globular fruit. Look for fruit pigeons including the lovely Rose-crowned and Superb Fruit-Doves in the Damson Plum, Terminalia sericocarpa, around Wongabel and the Curtain Fig forests. Other fleshy fruit eaten by birds at this time of year include fruit of the Satinashes, Syzygium tierneyanum, S. trachyphloium and S. australe. The first and last grow along drainage lines and the middle one grows best with its rough-barked, buttressed trunk on granite soils at mid altitude. Because of the dry seasonal conditions, much fruit development has been delayed and hence breeding too. Figbirds are building nests even now, when normally they are all fledged. Catbirds seem very hungry so may be taking more nestlings than usual. It would not be surprising to see a lot of late breeding or second attempts this 2015 wet season. I am wondering how this might alter the behaviour of the brood parasites, our large cuckoos which migrate to PNG for the winter. I think that those which have bred will collect their young for the northbound trip in February and still leave in March. Waders such as the Sharp-tailed Sandpipers will not leave until the end of April but will be harder to find as the water levels rise and grass grows to the waterline. Victoria's Riflebird males are well into their moult already so expect some calling and a little displaying in mid April. Towards the end of this period the Bush Stone-curlews will drive off their offspring making for some noisy nights for those of us lucky enough to share our lives with these endearing birds. Actually I am not endeared of the male of our pair at the moment as he has taken to shifting my boots and sometimes drags them out into the weather. As I write I can see him skulking towards the back door and he has just grabbed one now. This may have started as a territorial behaviour when breeding but now he does it outside nesting times. I chased him off into the rain and he is declaring his territory with the mournful cry. I see more tree-kangaroo mating behaviours at this time of year than any other. The male will engage in a good deal of stroking of the female on the back and tail and rubbing his head and neck under her cloaca. When in the wetter forests around Lake Eacham and Lake Barrine of a late afternoon, watch for the Hypsies collecting leaves to refurbish their nests. With all the moisture, leaves rot quickly and the nests need daily replenishment. Hypsi maintain multiple nests usually concealed in buttresses but sometimes in vegetative tangles. Their young (usually two or three) are retained in the pouch until 21 weeks and are then left in the nest where they receive periodic visits from mum to suckle. We won't see this season's young until the dry. I hope we have a better fruiting season this year as their numbers have not yet recovered from the cyclones over the last nine years. My life as a conservationist began on a hot, dry, eroded creek bank in the mountains to the East of Biloela. I had noticed that one of the Theiss Bros dozers building the railway had moved along the creek bank and cracked an Aboriginal grindstone. I knew there was plenty of evidence that Indigenous people had lived along this creek and not far from this site I had found a place where flint had been crafted into spear points. I wanted to preserve these stones as a record of the first inhabitants and so I began to wander up and down the creek banks, recording the places where I'd found evidence of campsites. I became concerned about the evidence that quite plainly showed these people had camped where there was no water. I knew the basic rule of bushcraft is to never camp where there is no water. So why, evidently, did the masters of survival choose this course? Perhaps the landscape had changed drastically. I chose a permanent spring in an area about 20 km away, where cycads grew, as my control site and went searching around it and in a very short time I had found all the rock types that were sited along my creek. One of the artefacts I found is now in the UQ Anthropology Museum and I took it there because this type of artefact was very different from others, made from another type of Aboriginal grindstone. This artefact had taken a very long time to manufacture and it could only have been made in camp sites that had access to water. They had also turned up along my creek bank. It was time to look at the European history of occupation and there were some old men who had lived in the area for 50 years or more. I soon found out that the headwaters of the creek had been 'rung' (ringbarked) during the Great Depression. The headwaters were in rolling hills composed of degraded granite; this had eroded and filled the creek with sand thereby destroying a resource that had supported families in the time before European occupation. I was stunned. We had just taken delivery of a large dozer that I had long agitated for but I surmised that it would be mainly used for clearing stock routes and roads and that this would have little effect. I was in an area called 'Green Gap' and a request had been made to clear around a gate that allowed us to bring stray cattle back from our neighbours' property. I sidled up to a huge Blue Gum, ran the tree pusher up and dug it in then began rocking it. As it began to rock, amazing creatures began to rain down - Giant Gliders, how beautiful they looked. The tree was doomed, hitting the ground and killing four of them. I was sickened and knew right then, this was wreaking a horrible destruction the equal of any that had come before. I told my Father that this was the wrong way to manage country and I was sure that purchasing the dozer was the wrong move. His reaction was expected but I had made my mind up, my time in the family company was fast drawing to an end. After a few years of wandering, I decided to return to the place I'd always wanted to live; Far North Queensland. I had spent the first 12 years of my life to the north of Chillagoe, the Eubenangee Swamp and East Palmerston but I had been impressed by Malanda and moved there to commence the struggle to survive long enough to send down roots, something many new arrivals to the district endure. I had lived in Brisbane for a while and been on the fringe of the fledgling Society for Growing Australian Plants. On the strength of this, Nigel Tucker gave me employment in the QPWS/TREAT Nursery at Lake Eacham where Russ and Joy Needham took me under their wing. Nigel taught me a lot about erosion and stream bank management while we were planting up the creek in Barry Thurling's property. I continued to learn as much as I could from Nigel and TREAT and began to practice soil conservation on a newly acquired property out at Boonjie. These 40, 80 and 120 acre blocks were known as 'Weed Farms' by the Eacham Shire Council but thanks to advice from Nigel and TREAT, I also came to understand the role weeds play in soil conservation and their transitional role in forest regeneration. I began to use as many plants as Nigel could spare, planting numerous Elaeocarpus angustifolius and various endemic laurel species, particularly Litsea, Cryptocarya, Beilschmiedia and Endiandra. I was assisted in my endeavours by the regrowth that was taking place around the bare trunks of long dead trees that poked through the Lantana. At this stage there was no discernible change in the mammal and reptile regimes (pademelons, pythons, Red-bellied black snakes) and birds that ate lantana fruit and nectar as well as the figs that grew on the stumps and trunks of the previous tertiary forest - Ficus crassipes, F. pleurocarpa and F. destruens. It has been my great pleasure to watch the changes over the years - more varieties of pigeons, parrots and reptiles as well as small mammals. All the changes required help. Thank my lucky stars for Geraldine. My Tablelands rainforest passion commenced when my parents purchased a weekender property with another family on PEI Road near Malanda when I was 12. The property was a mostly cleared ex-dairy farm which had a wonderful swimming hole with a waterfall surrounded by remnant rainforest. We were living in the Cairns suburb of Edge Hill at the time and I remember thinking that this was the most beautiful place I had ever seen and the only place on earth I wanted to live. A few years later they purchased another property at the end of PEI Road with more rainforest which had been cleared for dairying and selectively logged by a young returned soldier in the 1940s. Throughout my High School years I spent many weekends at 'The Farm' exploring the forest, collecting and trying to identify the rainforest fruits, and experiencing the wonders of cassowaries, pademelons and all sorts of possums along the forest edge during night-time spotlighting expeditions. We also spent a lot of time clearing lantana, planting avocadoes and restoring the old dairy milking shed into a weekend bungalow. These experiences were a fundamental influence in my desire to study science at University, so off I went to Brisbane in 1980 having just turned 17, to do a degree in Agricultural Science at the University of Queensland. Despite being nicknamed the 'slow' little girl from the north for my slow-talking, slow-walking ways, I graduated with First Class Honours and decided to accept one of several scholarships offered to me to complete a PhD. As I was already 2000 km from home, it really didn't seem unacceptable to move further afield to Perth and commence my PhD studies at the University of Western Australia which I finished in the record time of 3 years and 3 months. After working for several years with the incredible flora of Western Australia, Far North Queensland called me back home so I returned and was immediately offered a job teaching horticulture at the Cairns Technical College (TAFE). This enabled me to start spending weekends back on the Tablelands and it was during this time that I met Athy Nye. Our joint interest in native plants and rainforest habitat restoration was the chemistry in the relationship. The first time Athy took me to wander over his 'Weed Farm' at Boonjie he was worried that I would run a thousand miles from this crazy bloke and his dreams of restoring the rainforest. On the same visit I had already worked out where we would build the dream-house to take advantage of the wonderful mountain views and how best to go about replanting the property which had been completely cleared for dairying in the 1930s. The area adjacent to the Boonjie property had recently been declared part of the Wet Tropics World Heritage Area and the Community Rainforest Reforestation Programme established. So I joined us up and we started with a planting at the front of the property which was a degraded pasture of Brachiaria decumbens interspersed with lantana, giant bramble and wild tobacco. Everyone learnt a lot from this experience including the Forestry Department who received a big serve from me when I discovered that they had included West Indian Cedar (Cedrela ordorata), an exotic from the Caribbean, in the plantings. Noticing that native Oak species including Northern Silky Oak (Cardwellia sublimis) did especially well we decided to call the property 'Oak Grove' and plant the entrance with Atherton Oaks (Athertonia diversifolia). Twenty years on and thousands of native rainforest trees later we are now the proud owners of a restored rainforest property that supports an incredible diversity of wildlife including cassowary, pademelons, pythons, tree-kangaroo, musky rat kangaroo and numerous small birds including the rare Blue-faced Parrot-Finch. This was achieved through many tree plantings and lots of support from our friends and neighbours as well as TREAT. We have also been able to combine the restoration of our property with the successful development of a native rainforest fruit manufacturing business called Rainforest Bounty - but that's another story. .. The Tablelands Regional Council's (TRC) Community Revegetation Unit (CRU) nursery celebrated its 25th Anniversary in 2014, a year in which it was on the brink of being closed down. Overwhelming community support saw that situation averted for the time being. The CRU has survived many changes over the years. The Unit began its life in 1989 in Eacham Shire (one of three individual shires that make up the current TRC area) as part of the Wet Tropics Tree Planting Scheme (WTTPS). This scheme was created and directed by rainforest ecologist Geoff Tracey as a re-training program for ex-timber workers following the listing of the wet tropics rainforests under the Wet Tropics World Heritage Area. Mark Heaton managed the Eacham scheme for the first 12 years or so working closely with Geoff Tracey. Bronwyn Robertson managed the scheme for a few years following Mark's departure, then Sue Mathams took over for a short stint before we (Larry and Kylie) took it on during 2005. As from October 2014 Kylie is now running the nursery. The WTTPS originally started in Hinchinbrook, Mareeba, Eacham and Mulgrave Shires. It was administered by each shire council which received funding directly from the Federal government, through a structural adjustment package as a result of the cessation of logging in the Wet Tropics World Heritage Area. Numerous changes around 1994 saw WTTPS brought under the umbrella administrative organisation of the North Queensland Joint Board and expanded from four shires into eleven shires. The scheme now stretched from Thuringowa (Townsville) to Cooktown. Each Unit had a nursery or plant holding facility and a revegetation crew. The new shires worked in conjunction with one of the pre-existing shire units. For example Herberton and Atherton Shires operated under the Eacham Shire WTTPS and Douglas Shire operated under the Mulgrave Shire (now Cairns Regional Council) WTTPS. The NQ Joint Board also administered the Community Rainforest Reforestation Program (CRRP) and was now responsible for acquiring funds to run both WTTPS and CRRP. Direct funding to the WTTPS had ceased. Each shire council paid a precept to the NQ Joint Board to cover the administration costs of these activities. The Joint Board soon became the North Queensland Afforestation Association (NQAA) and with the partial sale of Telstra, the new Natural Heritage Trust program in 1997 became the major source of funding for the WTTPS. Kylie was the roaming Joint Board botanist, covering the 11 shires until 1999 when Simon Gleed took over. NQAA provided technical support for all of its member councils in relation to planning and implementation of strategic and priority revegetation projects. There was an annual process whereby each individual council WTTPS submitted new project proposals to a quality assurance committee team which included input from Geoff Tracey, Peter Stanton, Steve Goosem and Kylie Freebody. Thuringowa withdrew from the NQAA after a couple of years as did Mareeba in the early 2000s. The remaining councils retained WTTPS with NQAA until its closure around 2004. Following this, the Units were thrown to the mercy of their individual councils. Hinchinbrook and Cooktown closed and Hinchinbrook even dismantled their state of the art nursery. Herberton and Atherton closed but maintained their connection with Eacham. Today the surviving WTTPS units are CRU, Cairns, Douglas, Cassowary Coast and a revitalised Hinchinbrook. Council has always been at a loss to find a place to put CRU. There was much shuffling around with CRU moving from the Department of Infrastructure and Construction to Community Services then back to Infrastructure, then to Planning and Development then back to Infrastructure after amalgamation. In November 2014 CRU became part of Community, Regulatory Services and Planning. Unfortunately 2014 has brought many changes to CRU. In mid-year, TRC announced that following de-amalgamation in January 2014 and numerous state and local government operational changes, it had found itself in a dire financial situation where only Council core business services could be maintained. This placed direct pressure on the survival of CRU which was not seen as core business. It took five months of lobbying with Council to reach an outcome where Council has agreed to keep the CRU nursery facility running in a 'cost neutral' situation till the end of Dec 2015 and then it will review the operational budget. At the end of 2013 CRU had a total of 5 full-time and one part-time staff. Now, at the end of 2014, the CRU nursery has the equivalent of 0.5 full-time staff. While Units in other shires merged with Parks and Gardens or Land Protection or did their own in-house projects (e.g. Catana Wetlands by Cairns Regional Council), CRU continued to grow and plant trees on a large scale. For many years, TRC was the only Council which maintained a revegetation crew which worked largely on external projects. This was due to the unique Tablelands dynamic with its myriad of active environmentally-based community groups and tree-change individuals and organisations. Over its 25 years, CRU has brought more than $2 million into the local community and businesses through successful grant-funded projects. These projects have planted trees for both land management and biodiversity conservation. Land management includes erosion control, creek bank stabilisation, eradication and replacement of pest plant species, and planting stock shelter belts and windbreaks. Biodiversity conservation includes habitat plantings for iconic Tablelands and Wet Tropics flora and fauna, corridor plantings and riparian repair. In addition to grant-funded tree-planting projects, CRU has played a major role in 'greening up' the landscape by planting substantial areas in reserves and recreational areas. Areas planted include Ellinjaa Falls, Malanda Falls, the Johnstone River Esplanade, Hallorans Hill, Tinnaburra peninsula, Platypus Park and Winfield Park. CRU has supplied more than 830,000 trees to community groups, councils and individual landowners. It has been responsible for planting more than 300,000 of these trees - an average of approximately 12,000 trees per year. Major tree planting achievements of CRU include 30 km of waterways planted, 40 ha of habitat planted for rare and threatened and iconic wildlife species, and 10 ha of Council reserves planted. CRU plays a broader role in the community. It is actively involved in educating, engaging and supporting the community in appropriate land management activities, training (for TRC staff, Green Army participants, Conservation Volunteers Australia, School for Field Studies students), work experience for high school students, hosting Job Services Australia/QITE participants and Community Service work for Qld Correctional Services participants. CRU's success would not be possible without the strong partnerships with community groups (Southern Atherton Tablelands Revegetation Alliance), agencies (Wet Tropics Management Authority, CSIRO, Department of Environment and Heritage Protection), non-government organisations (South Endeavour Trust) and researchers (Griffith University) all actively working towards sustainable land management and biodiversity conservation across the Atherton Tablelands. The nursery operates on Tuesday and Thursday every week with the assistance of a small group of dedicated volunteers who help with the nursery tasks of seed processing, propagating and potting. Our 'vollies' contribute around $57,000 of in-kind labour per year. New volunteers are always welcome. We hope that CRU will continue to prosper and service our community into the future. Greetings to all, and I hope everyone enjoyed a pleasant break over the festive period. The nursery work program is just kicking off for the year with plenty to do over the next few months preparing and allocating stock for the many various plantings planned for this season. As part of the regular Friday work program, preparations will include pruning, sorting and sizing of stock as well as weeding and consolidating of stock. There will be much to do as nursery staff will be busy removing stock for TREAT member and other planting allocations during other week days. Seed collections have increased as expected for this time of year and there should be a regular supply of fruits to be processed and seeds to be propagated on Friday mornings. As well as the scheduled Saturday morning community plantings there are a number of planned QPWS plantings also to be undertaken this planting season. Tableland QPWS staff from the Tinaroo Base will be undertaking a number of screening plantings within the recently redeveloped campgrounds at Platypus Creek, Downfall Creek and Kauri Creek. Other QPWS projects on the coastal lowlands at Eubenangee Swamp National Park and a number of sites in the Mission Beach area will be planted following the Tablelands planting season, when the risk of flooding is reduced. We look forward to seeing you all at the nursery or the community plantings again this year! On Sunday 2nd February 2014 a tree planting morning was held at Ringtail Crossing Nature Refuge with 9 experienced planters. This was not a 'normal' planting. Of the 600 seedlings planted, 245 were timed, to find out just how long it takes to plant trees in our usual way - augering holes, fertilising and mulching. Angela and I had been surprised at figures presented by a School for Field Studies student when delivering a directed research paper at their community night at Yungaburra. The student used as reference a report published by Preece N.D., et al. in the Ecological Management and Restoration (EMR) journal (Vol 14 No. 1 Jan 2013) titled 'Planting methods matter for cost-effective rainforest restoration'. This report stated that it took nearly 4 times as long to plant 245 forestry tube seedlings using an auger than it would using a planting spade - 38.2 trees per hour with a spade compared to 10.2 using an auger. Now, Noel Preece and Penny on their Thiaki property are examining optimum methods for revegetating long-cleared rainforest areas - see TREATNews Storm Season 2013. They are investigating a cost-effective method for planting using forestry methodology. This incorporates wider spacing (3 m), fewer species, smaller tube sizes (forestry tubes), using planting spades, different site-preparation methods (sprayed 2 weeks before planting and limited to a 1 m radius circle around each planting hole), not using fertiliser in the holes and an alternative after-planting maintenance regime (e.g. annual weeds left to grow during the dry season). On our property, Angela and I are planting for biodiversity habitat enhancement, creating a corridor between two forest areas. 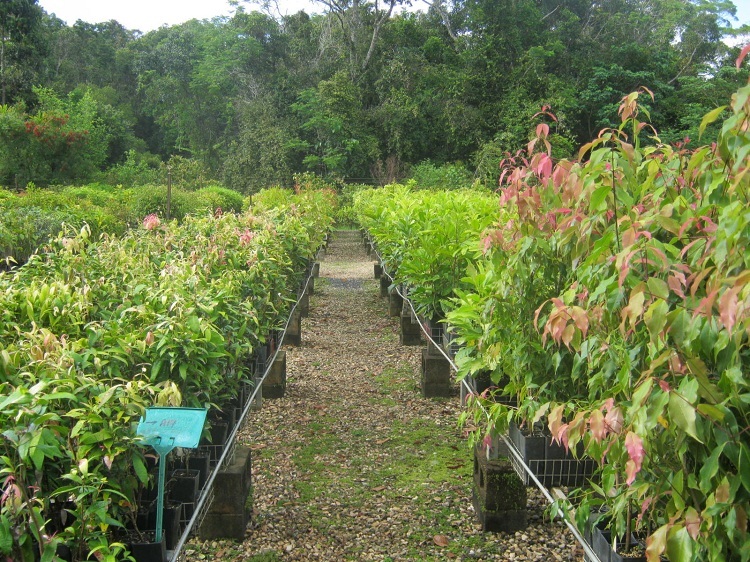 We use a methodology developed over the 30 plus years of revegetation work on the Atherton Tablelands by TREAT and other practitioners such as ourselves. We use techniques that give the best chance of achieving canopy closure in a 2-4 year period. This approach is more expensive in the first year, but it pays off in future years. We use closer spacing (1.8 m), high diversity of species with the inclusion of pioneers, and obtain improved performance in growth and higher survival by using mostly Supa-tubes instead of forestry tubes. We find that site preparation by blanket spraying at least twice, and rigorous maintenance is essential to achieving good results and early canopy closure, thereby reducing the overall cost. Dr Cath Moran volunteered to oversee and time our planting trial, then compile the results and author a report for publication in the EMR journal. The site was well prepared with weed control performed during the 6 months prior to the planting day, as per our usual preparation and method. The holes were 'chipped' prior to the planting day and the time taken included in the overall total. On the day of the trial, holes were augered using a one-person Stihl Bt121 auger with a 150 mm planting bit, fertiliser was put in the holes, 245 Supa-tube seedlings of 62 species were laid out, planted and mulched. This was done by 9 experienced volunteers. It was recorded that all activities took a total of 8.24 person hours. This equated to 29.7 seedlings planted per person hour - not 10.2 as stated in the Preece N.D., et al. report. Times taken to complete the activities associated with planting 245 seedlings. 'Total time' is the cumulative time taken to complete the task e.g., if 2 people worked on an activity for 20 minutes, 'Total time' would be 40 minutes. In November 2014 (10 months following the planting) Cath, Angela and I measured the height of all seedlings planted, from the ground to the base of the top bud. The average height was 98.2 cm. We recorded a loss of 11 seedlings from the 245, a success rate of over 95%. A report has been submitted for publication in the EMR journal. It contains details of our timed trial results, how these fit into the bigger picture of revegetation and the total costs involved to reach the point at which the trees will begin to return to natural forest without ongoing maintenance. Thanks to Peter Snodgrass and Nick Stevens for sharing their knowledge and to co-authors and reviewers of Cath's report - Prof. Carla Catterall, Kylie Freebody, Larry Crook and Angela McCaffrey. Thanks also to the volunteers who helped plant the trees and especially to Cath Moran who spent many hours on this project. Klema, M. Assessing the Value of Public-Private Partnerships for Rainforest Restoration in the Atherton Tablelands, Wellesley College, MA, United States. Directed Research project, Centre for Rainforest Studies, The School for Field Studies, Yungaburra Qld, May 4, 2013. Preece, N.D., van Oosterzee, P., Lawes, M.J. (2013) Planting methods matter for cost-effective rainforest restoration. Ecological Management & Restoration 14, p63-66. Van Oosterzee, P., Preece, N.D. (2013) Thiaki Reforestation Experiment Update, TREAT Newsletter, Storm Season 2013.